This entry was posted in Environment, Gardening and tagged hen pheasant. Bookmark the permalink. You must live in a beautiful part of the countryside – I’m in a town, with occasional seagulls, and am going green with envy ..
We are very lucky as we do live in beautiful countryside but have several market towns and Oxford all less than a 30 minute drive away. However, all this photogenic wildlife comes with a downside; that exquisite pheasant and her mates trashed about 200 tulip bulbs and yesterday I filmed a large rabbit standing on his hind legs and devouring all the young beech hedge leaves he could reach. They all run under the holly hedges when the dogs appear in the garden and pop back out again once the coast is clear; it’s like living in a Beatrix Potter story except that none of the animals are wearing clothes – yet. Was she on her nest, do you know? No, she had just fallen asleep in that very warm sheltered place near the door. I think she might have settled there if only humans passed by but there are always dogs coming and going through that entrance and she slipped away when evening came. 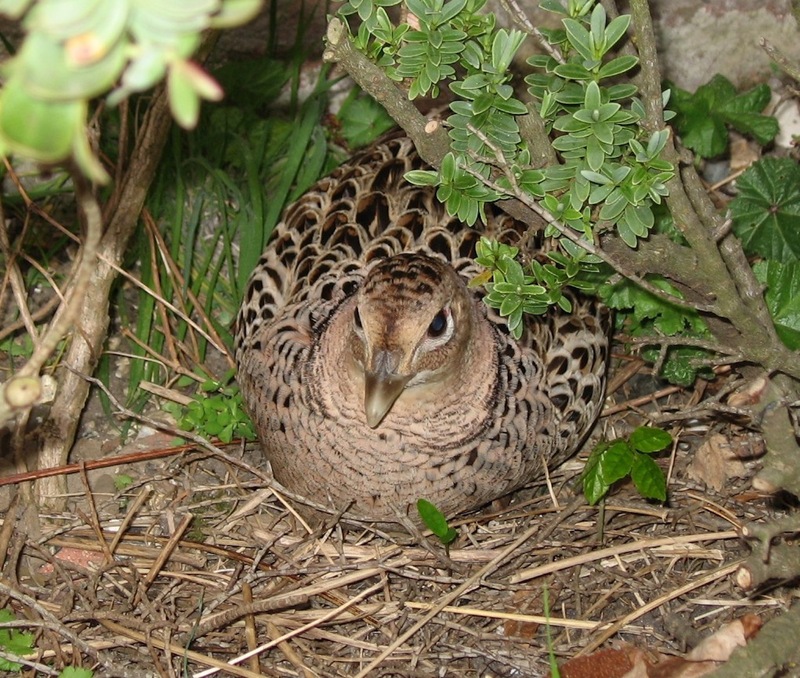 Over the years several broods of pheasant have hatched successfully further out in the garden.